This popular meme is frequently used in rage comics with the caption “Watch out guys, we’re dealing with a badass over here.” Internet users usually appropriate the meme as a response to pretentious and arrogant statements (Source: Know Your Meme). 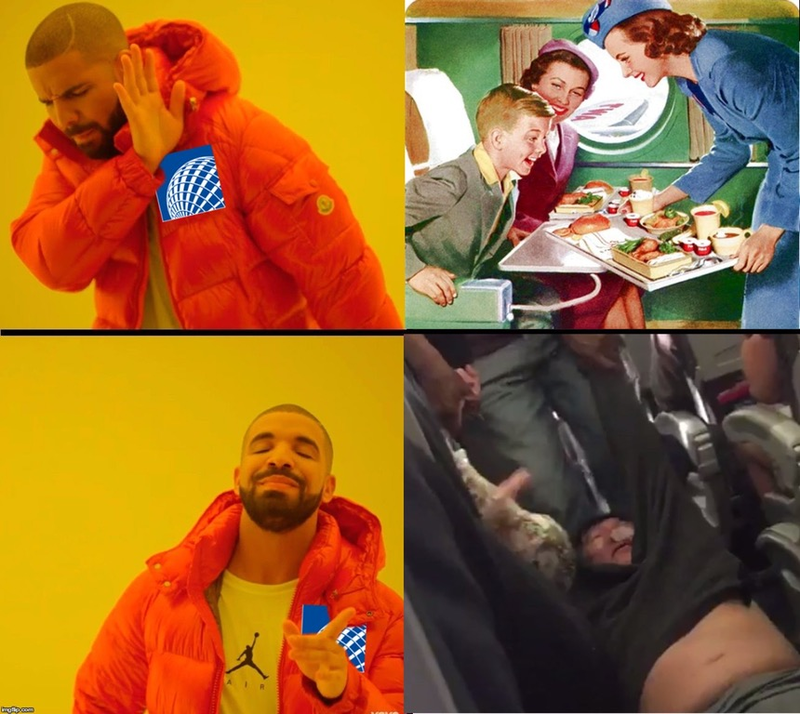 This meme about the United Airlines Passenger Removal refers to the controversial ejection of a passenger from a United Airlines flight, after the airline informed the plane that they would be randomly selecting ticket-holders to give up their seats (Source: Know Your Meme). It is undeniable that the Internet has changed the way we perceive the world. With increased access to the World Wide Web, people are now able to exchange information with family and friends around the globe without geographical boundaries. Either by using a smartphone to share a 140-character message on Twitter to help find the victims of a natural disaster, or by denouncing human rights violation in war zones, the Internet has also expanded how we help one another as individuals. This wide access to the Internet, however, also facilitates a formation of a new media practice that every user of social media has come across at some point: Internet memes. Often shared in several social media networks as photoshopped images of celebrities with captions, memes reflect the use of humor to satirize a situation or a behavior. But the idea of what meme means first emerged before the Internet itself. In his bestselling book “The Selfish Gene,” evolutionary biologist Richard Dawkins coined the term to convey the idea of a unit of cultural transmission usually performed through imitation. In fact, ‘mimeme’ comes from a Greek root, but Dawkins’ intention was to simplify it to ‘meme.’ This way, the word ‘meme’ would resemble the sound of the word ‘gene’ because the theory relied on the assumption that cultural transmission is analogous to genetic transmission. According to Dawkins, memes originate within what he deems the “soup of human culture,” an allusion to the conditions that may have potentially enabled complex chemicals to become self-replicating molecules in the oceans during the early phase of the Earth. Memes, within this broader definition, include anything that can be replicated in culture such as big ideas, catch-phrases, tunes, fashions, cultural artifacts, language, art, technology, etc. For example, the question whether God exists is a meme, that is, an idea that spread from brain to brain over time. Not only the idea itself is a meme, but all the variations that it causes — the magnificent architecture of temples, the sacred texts, and the variety of specific religious practices. Dr. HyeRyoung Ok, an adjunct instructor at the SOJC and specialist in digital transmedia and transnational media culture, explains that the playful participation of youth on the Internet reflect what is known as participatory culture. “Young people tend to combine participation in social and political affairs with parody, humor, wit, and caricature to express their feelings and opinions rather than direct criticism,” says Dr. Ok. In the era of the Internet, memes effectively demonstrate how participatory culture allows youth to participate in virtual discussions in a way that reflects what individuals experience in the “real world.” Media scholar Henry Jenkins defines participatory culture as a social behavior with relatively low barriers to artistic expression and civic engagement, strong support for creating and sharing one’s creations, and some informal mentorship whereby what is known by the most experienced is passed along to novices. Sharing common characteristics that are constantly imitated and modified, memes circulate virtual spaces every second of every day with awareness of each other– slang, drawings, photos, videos, icons and even bogus quotes can become a “hit” on the web. Currently, an endless amount of websites and blogs popularize this new media. In fact, it is near impossible to know who was the first to use Neil deGrasse Tyson with his hands up in the air saying “watch out guys, we’re dealing with a badass over here,” for example. The interesting aspect about memes, however, is that it is not exclusively about humor. In cases such as the recent scandal with a passenger being forcibly removed from a United Airlines flight, Internet users create and circulate memes as forms of persuasion or political advocacy, grassroots action or forms of expression, and public discussion. They reveal a decentralized online culture where everyone, regardless of your economic or educational level, and can participate in a collective discussion that contributes to the public sphere. The use of memes on the Internet reflects an interconnected world where young people continually have a voice not only to share humorous media content but also to bring attention to and critique societal controversies and political issues. Although the discussion about memes is recent and often overlooked, it is important to understand what it entails. After all, when the future historians study our current times, memes will certainly be an important aspect to be taken into consideration because they constantly reflect our interconnected cultural moments.